electro-music.com :: View topic - Any interest in another Quad Bass++ run of PC Boards? Any interest in another Quad Bass++ run of PC Boards? Posted: Wed Oct 10, 2012 4:29 am Post subject: Any interest in another Quad Bass++ run of PC Boards? I have been getting requests from several folks about bringing the Thomas Henry Quad Bass++ PC boards back into production. The documentation can be found below. The boards will be $28.00 USD plus $5.00 flat rate shipping anywhere. I need to have at least an order for 25 boards or more to do the production run. Right now, no preordering, just an idea if anyone wants them. What are the boards dimensions if you don't mind me asking? Would ideally like to mount this on a Euro sized panel. Kind of large which is reason why I may want top go with with a two voice version in place of four OR keep four drum voices and use SMT parts in order to produce a smaller PC board. This could be a poll also but first want to see the interest in this. I would be interested, would prefer through hole to SMT, would be open to two x two voices instead of one x four, if that makes life easier for our Euro friends, assuming it doesn't mean $56 for two boards . Only really interested in one at this time though. I'd be happy with a 2 voice board too. Were you thinking of all smt components or just resistors and capacitors? I'd be happy to tackle passives with a soldering iron but would be nervous of trying a chip. I would be interested, would prefer through hole to SMT, would be open to two x two voices instead of one x four, if that makes life easier for our Euro friends, assuming it doesn't mean $56 for two boards Wink. LOL Oh my no ... ! OK, thanks for your input and you make a good point also in terms of fitting into smaller form factors. OK, with regards to the SMT, I will consider it but would really like to keep all components SMT. The chips would be SOIC and to be honest, I personally can solder those faster than any DIP IC and find it easier. You may just be surprised at just how easy it really is with no special equipment except a magnifier. As far as a two voice PCB, well, that's two for two. I would agree, if it was going to be SMT, I'd want it to be all SMT and bite the whole bullet. Well I guess I'd better not be such a wimp and go for the SMT chips as well I've been soldering since the late 80's so I should really b up to the task! Oh your not alone really. I was in the same situation until finally about 4 years ago I had to learn how to solder the SMT hardware since many chips I use are not even in DIP or easy to solder packages. I ended up getting SMT training kits with dummy components, so to not destroy perfectly good components, and watched lots of training videos online. Finally, I practiced and learned. 0805 and soic is really no problem at all! and you can mix it with TH as necessary anyways. I agree Matthias. I would say that 0805 sized passives and SOIC are probably the best for SMT starters AND they make circuit boards very compact by putting components on both sides. The are more affordable when getting manufactured additionally. I'd be interested in 2-4 voices of this. I'd be interested in 2x quad boards. I don't mind SMT at all, works just as well for my soldering setup. I'd be interested(interested enough to register:) in buying either a 1x4 or 2x2 board. SMT might be a laugh, why not? I'm just getting started in DIY but am interested in this. in either 1x2 or 1x4 - whichever really. I'd like to do it Euro format though I'm a little scared of this talk of SMT. So cautious interest registered I guess? Ok guys, thanks for more of your feedback. I will keep this going for a bit Longer and then make my decision. Having now had a go at SMT soldering I'm more than happy with 0805 sized passives. A fine tip on your iron and a pair of reverse grip bent nosed tweezers and it's really quite easy. I already have all the bits needed for a build like this in my parts bin. None of them are SMD thought. I guess finding the LM13700 as SMD will limit the list of usual sources quite a bit. Builders outside US might prefer if there where a component kit available to them if this is happening with SMD. I know that this is the path I would have to take. Thanks for your input. I will no doubt source parts for it. This makes it much easier, quicker, and less costly . Hi Guys, I kept this going for a while and it looks like a fairly underwhelming response thus the Quad Bass++ is officially a dead project. I am sorry guys as these boards are getting more expensive to get manuafactured and with only two or three interested, it's a no brainer. I thank those who did respond. Happy and healthy holidays to all !! I've got one board for the MPS I plan to build this winter. How does the MPS compare to Bass++ ? The few demos I've found on the net it looks like it's very easy to go wild with all the controls on the MPS. And not actually ending up with a drum sound. Although that can be very creative it could also be very annoying trying to get drum sounds from 4 channels. ...asking course the MPS board are still available her at EM. No worries and totally understandable. Knocked up a stripboard layout a while ago and will put one together when I have time. To many other things on the go at the moment anyway. 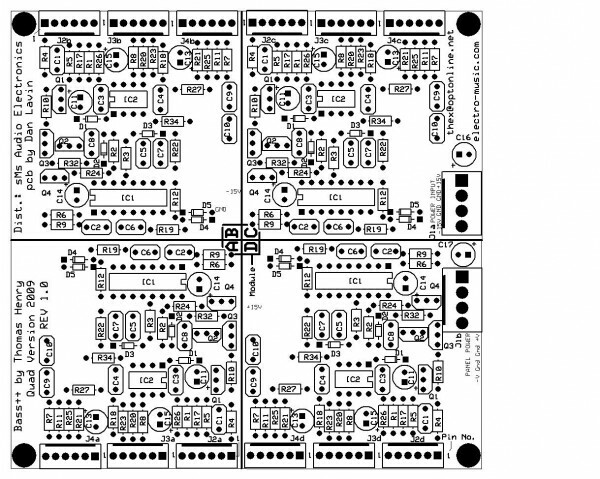 I can always lay out a pcb myself in the future if I need to.